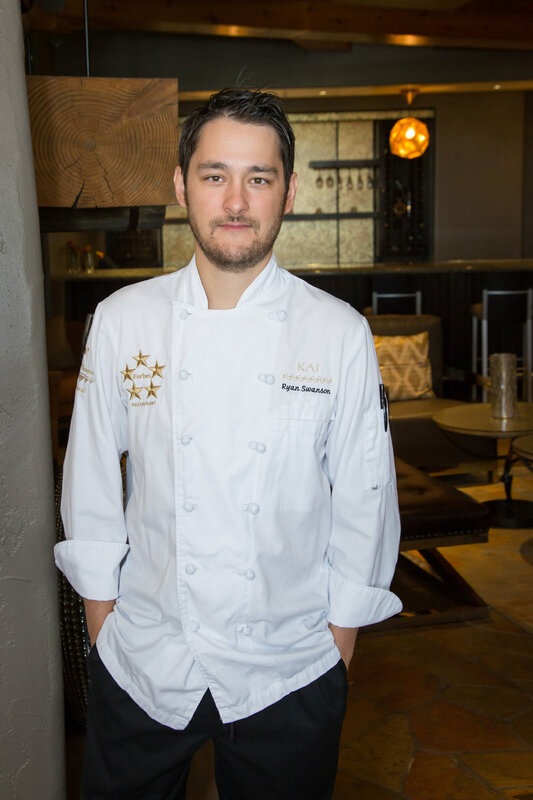 Chef Swanson brings a vast level of expertise to his current position as Chef de Cuisine of Kai, at Sheraton Grand at Wild Horse Pass. In his role, Swanson oversees the daily operations in Kai including all ordering, scheduling, staff training and nightly implementation. Most importantly, Swanson oversees the creative process and drive all new menu development in Kai; from exclusive wine-dinners and private events to each frequent and inspired seasonal rotation. With 17 years of experience in the luxury hospitality and culinary industry, Swanson has developed an extensive background in luxury and world class service. Swanson has held many notable positions at the resort. Most recently, Swanson was the Sous Chef in Kai for 6 years. Prior to that, he was the Chef de Partie in Ko’Sin Restaurant. He was also specifically recruited to help open the Chef’s Club in Aspen, Colorado. Swanson has a natural enthusiasm for incorporating fresh, seasonal and local ingredients into culturally relevant dishes that not only satisfy the most selective of appetites but also pique each diner’s curiosity for the connection between the history of the Pima and Maricopa People and the culinary experience offered in Kai. Chef Swanson has played an instrumental role in helping Kai earn and maintain their AAA Five-Diamond and Forbes Five-Star status. Swanson was also named the resort’s “Rising Star of the Year” in year 2014. Chef Swanson is also honored to have been apprenticed under Vincent Guerithault, one of the few James Beard award-winners in the Southwest. Swanson’s biggest personal accomplishment was earning the title of Sous Chef and now Chef de Cuisine of Kai. Chef Swanson graduated from Scottsdale Community College Culinary Program with honors in 2006. Swanson currently resides in Tempe. We he has time away from the kitchen, he enjoys hiking, golfing, hockey, listening to vinyl records and traveling.